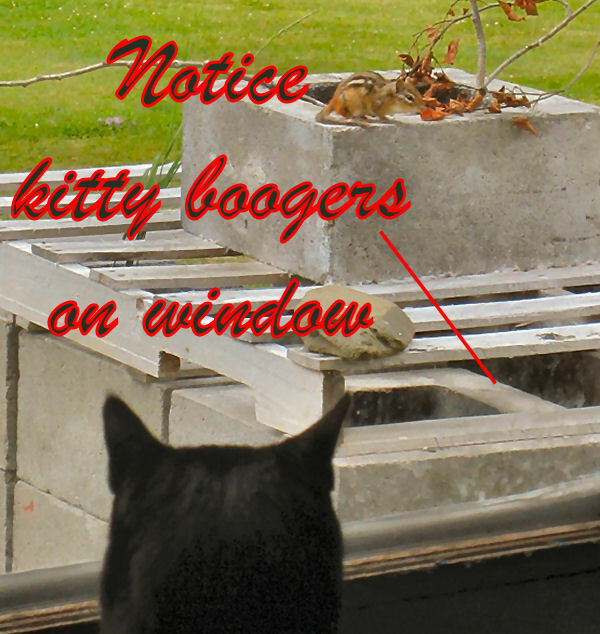 Chuckles and Mr. Chips …a sordid cross-species love affair! Over the years there have been strange cross-species relationships reported in the news. 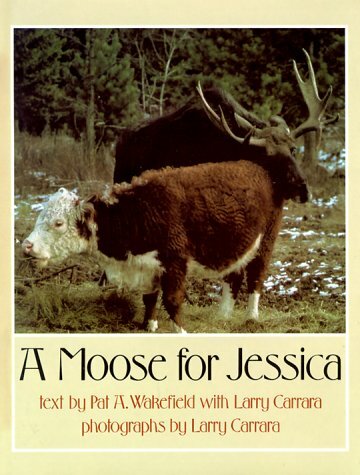 Back in the 1980’s there was a moose in Northern Vermont that was smitten with a Hereford cow. There was Koko the Gorilla and All Ball the kitten; Surya the orangutan and Roscoe the Hound Dog; Owen the baby hippopotamus and Mzee the Tortoise – all very strange but very adorable cross species relationships. But the ones that are the most fascinating are relationships that develop between animals that are naturally prey and predator like Mademoiselle Giselle, the Papillon dog and Finnegan, the squirrel; Aochan, the rat snake and Gohan, the Hamster, and now between our 10 month old kitten, Chuckles, and a charming little chipmunk we have named Mr. Chips. It’s taken us a few days to figure out what is going on between these two. 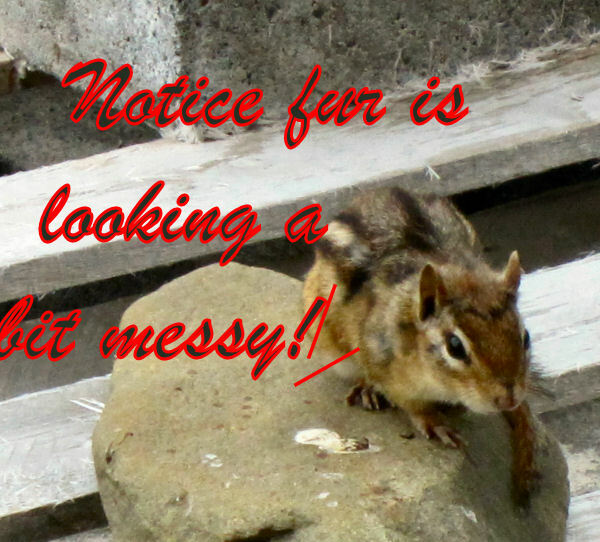 I knew that a cute little chipmunk was visiting the birdfeeder area right outside the patio door in our bedroom. 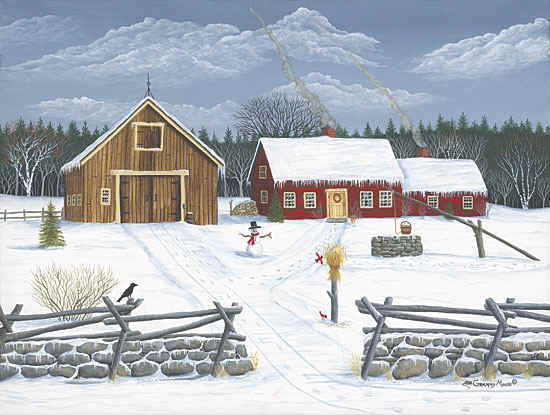 I had watched a few times and saw that after stuffing his cheeks with seeds, he would scurry across the lawn and duck under an outbuilding on the far side of the lawn. 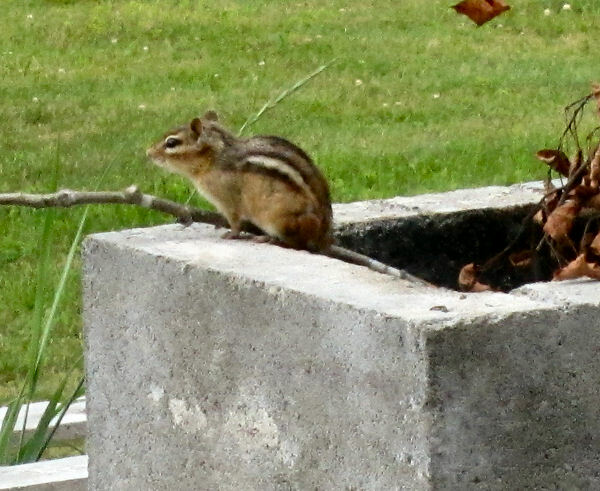 Chipmunks are subterranean dwellers so I figured his little burrow was under there. 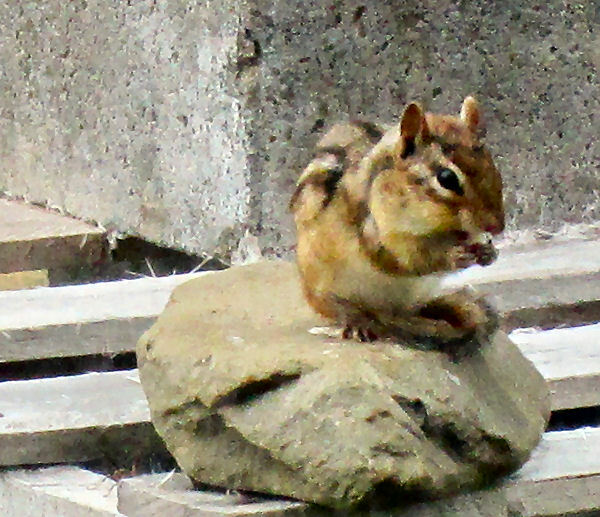 Mr. Chips stuffing his adorable chipmunk cheeks with sunflower seeds. Then last week I noticed Chuckles was crouched down in the tall grass that had grown up along the foundation of the same building. First I thought he was cooling off in the shade. 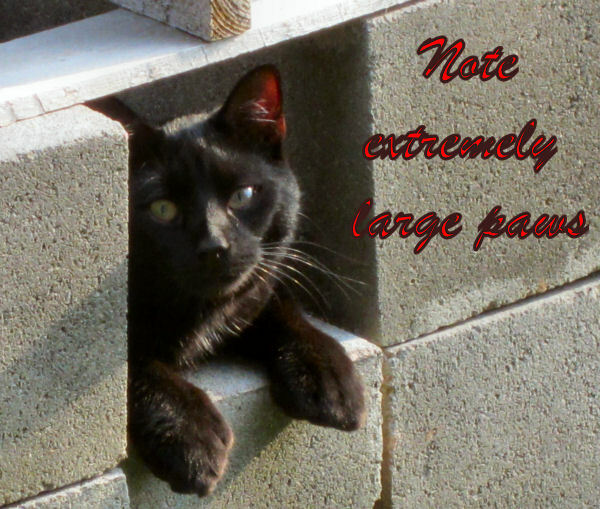 Being a black, fur-covered kitty cat can’t be easy in hot weather. 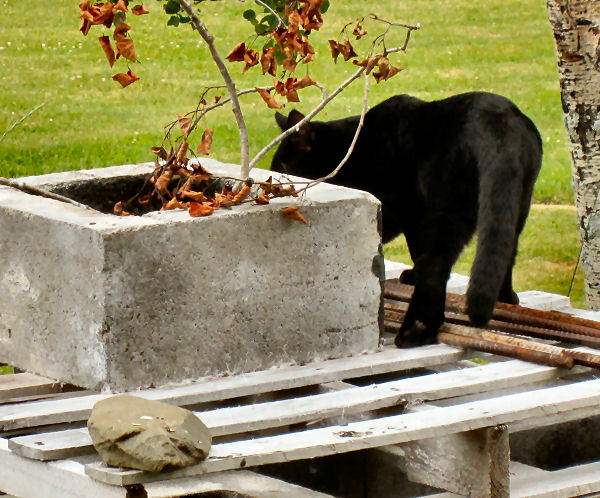 He spent a couple of hours there, but it was really hot so I didn’t think too much of it Then a couple of days later, Bill had let Chuckles out through our bedroom patio door and I heard him exclaim, “Wow, that cat is fast. He caught a chipmunk out by the birdfeeder. You should have seen him. 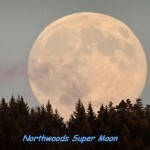 He sprang through the air and then hit the ground running. He actually got the chipmunk. He is one fast cat! You should have seen him”. I was thinking, “Glad I didn’t. It was probably that sweet little chipmunk that was under the feeder.” Only a man can get excited about the whole hunter/predator thing. The thought of hunting down the prey must give them a testosterone rush of some sort. I am more like Snow White wanting all the little creatures of the forest to love each other and scamper about at my feet (really Sheryl, at age 65….give me a break). I had been planning to lure Mr. Chips (yes, I had given him a name) into eating sunflower seeds from my hand. I had gone as far as to purchase a bag of shelled walnuts the day before, thinking I could really peak Mr. Chips interest. 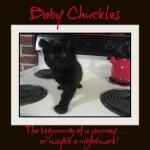 And now Chuckles had crushed my fantasy with a swipe of one of his humongous black paws. I looked out the patio door seeing if Chuckles, the crazed Chipmunk killer, was anywhere in sight. Nothing! At least Chuckles wasn’t proudly standing at the door with Mr. Chips’ tail hanging out of his mouth. He spared me that agony. So I was off to do my daily chores trying to convince myself that Chuckles was not a serial killer, but merely a victim of his natural nature-given instincts, and vowing not to get emotionally involved with small rodents ever again. An hour later as I was putting freshly folded laundry away in Bill’s bureau, I heard a funny chattering cadence outside. 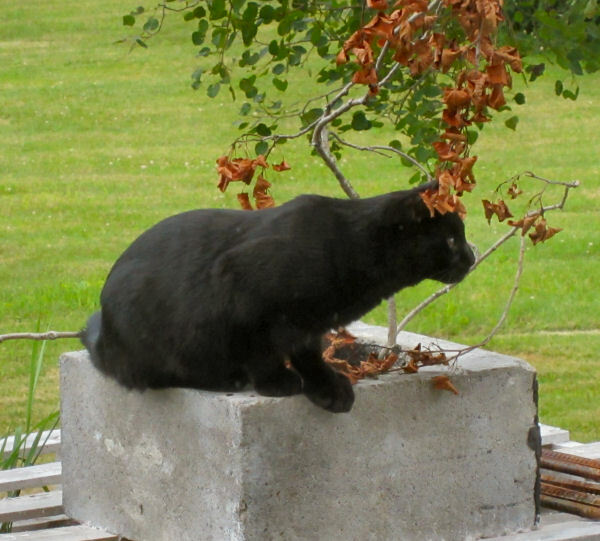 And when I went to the patio door, there was Mr. Chips perched just outside the door on a pile of cement blocks that Bill will be using to construct a chimney for the woodstove in the bedroom. He was alive! His fur was a little messy looking from dried kitty spit and dirt but he was alive and quite active too. 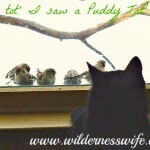 He was sitting upright perched on his hind legs making these funny little chattering noises. “Geesh, Chips, keep your mouth shut. What if Chuckles hears you”, I thought but he was persistent, almost seemed defiant like he was declaring it his territory. Score one for Mr. Chips. He managed to get away from Chuckles….. Or so I thought. I turned to see Chuckles strut through the bedroom door, tail sticking straight up like a banner. Bill was right behind him. “My boy, Chuckles was napping on the back porch. I let him in so he could have some Kitty food”, Bill said. “His boy” – right, the pets are always Bill’s until they puke or crap on the floor. Then it’s, “Your cat made a mess in the kitchen. 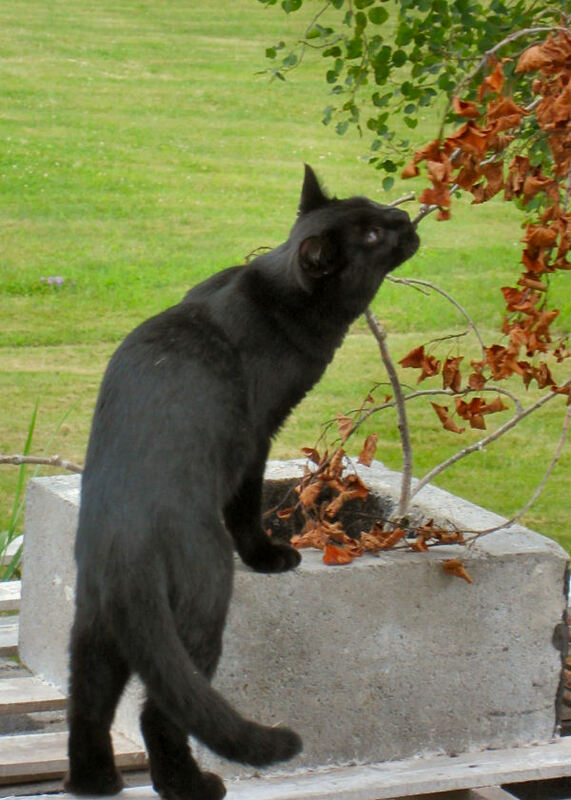 You better go clean it up.” And so much for the Kitty food, Chuckles spotted Mr. Chips as he swaggered past the patio door and now he was wanting to go outside so he could maul my little Mr. Chips again. Who wants Kit ‘n Kaboodle when there is “filet of munk” on the menu? No way, Pal! You are grounded! Wipe off the kitty spit and you have a cute little chipmunk…still very much alive! 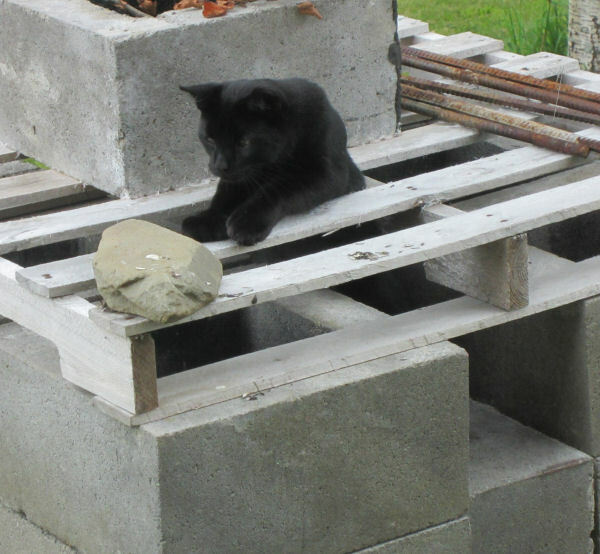 Two hours later, Mr. Chips was still there on the cement blocks and as mouthy as ever. Chuckles had been going nuts! First he would scratch at the door, and then he would perch on the chair by the door staring intently at Mr. Chips, then back to the door meowing and scratching at the glass. Chuckles was intently keeping an eye on Mr. Chips! Just a little too focused for my liking! “No way, pal. You’re going to have to wait for Chips to fill up on his seeds. You can Meow all you want!” I left Chuckles sitting by the door crying to go out. Forward to the next morning, no Mr. Chips at the feeder so I let Chuckles out the patio door. 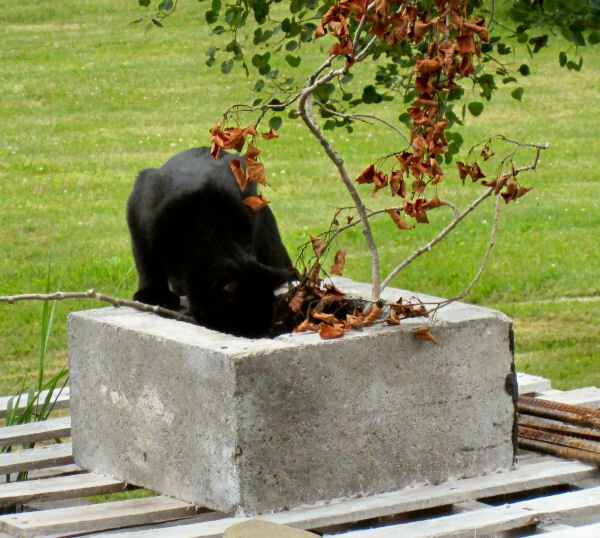 He quickly jumped on the cement blocks and checked them out thoroughly. Are you in there my tender little morsel? Hellllooooo down there! Are you there little buddy! Yikes! I gotta go on a diet! My kitty but is way to big! Almost! You in there, Chips? I learned this camo technique in Kitty Sniper School! 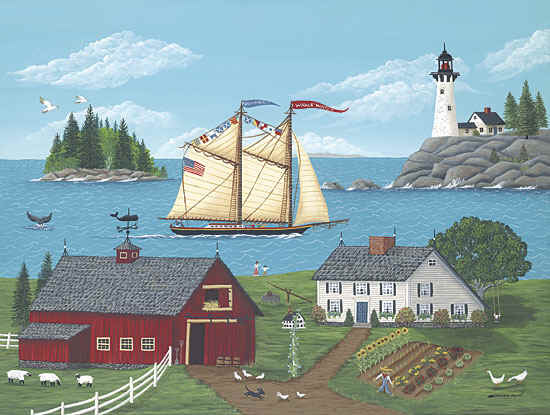 In and out, up and down, sniff, sniff, sniff, Chuckles scoured the blocks for Mr. Chips. Oh no, Mr. Chips just poked his head out from the blocks and Chuckles had him! Dumb Chipmunk! Probably there was brain damage from yesterday’s attack! There he was, proud Chuckles, with Chips legs and tail dangling out of his mouth. Bill’s psycho killer cat is going to maul sweet little Chips. (OK, Bill isn’t the only one to hand off pet ownership when things get nasty.) As I opened the door screaming, he took off across the lawn with Mr. Chips. And I am after him screaming, “Chuckles, NO, No, NO!” He drops him and Chips is running but not very fast and definitely not away. I’m thinking he’s definitely brain injured because he turns around and runs back to Chuckles. Chuckles lays down and rolls over as Chips runs up and down his body. Chuckles grabs him between his paws and rolls around with him. Suddenly it makes sense. They are playing! 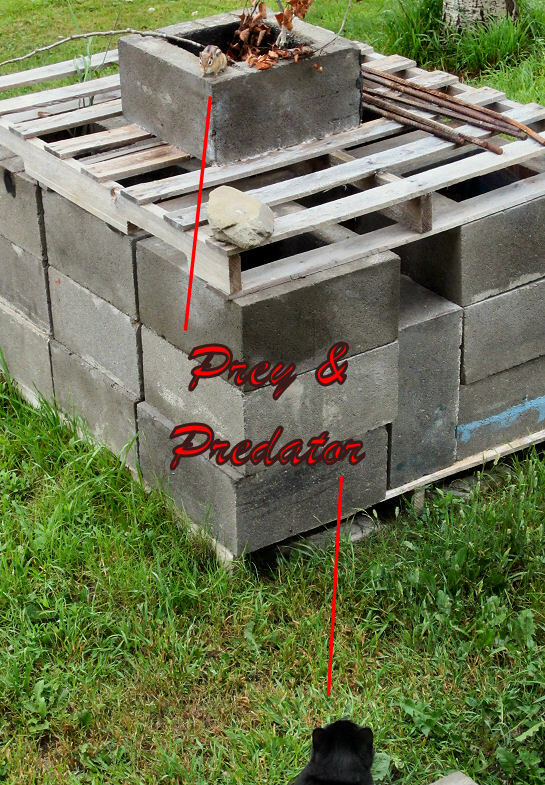 Prey and Predator or …… two star crossed lovers? 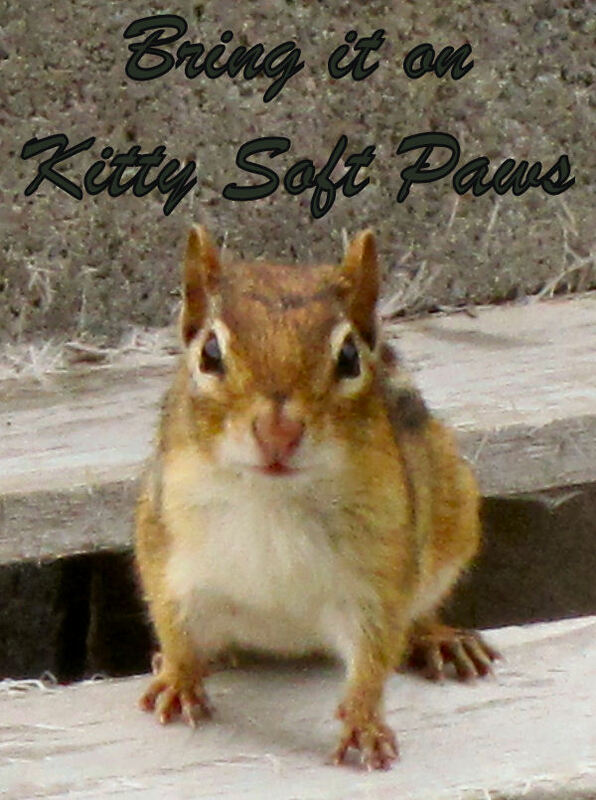 Bring it on “Soft Paws” . I’m watching you! You got game, cat? It has been going on for a couple of weeks now. 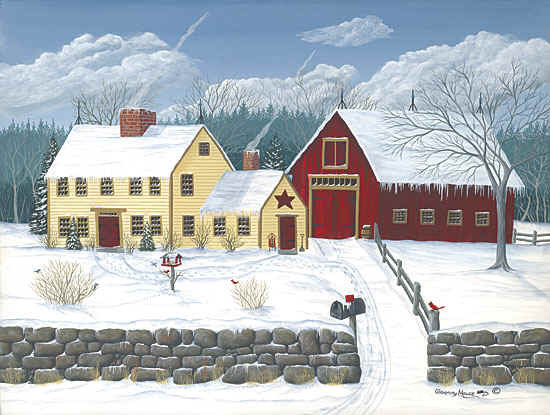 I see them out by that outbuilding, along the edge of the lawn, up by the feeder. Mr. Chips starts to run, Chuckles pounces on him. They roll around. Chuckles carries Mr. Chips in his mouth. He puts him down and they play their tag game over and over. Chuckles is still a kitten and he evidently hasn’t got the killer instinct yet. I hope he never develops it. I can continue my Snow White fantasy! We called him Chuckles because we started laughing every time we looked at him! Those great big feet…maybe we should have named him “Sasquatch”! What a fun and entertaining story. Chuckles had me chuckling! So glad that he just mauls Mr. Chips and doesn’t devour him! Thanks for sharing with SYC. 😀 This is such a great read! I have a pet rabbit and I can totally relate to “My boy chuckles” and “your cat made a mess”. Critters are so cute and unpredictable, aren’t they? I guess that gives them something to do when they are bored! Such a cute story! Love it! I loved your story and could relate too! We had a hound that considered any small dog a varmit and we paid a huge vet bill over one incident. Then one day, our of his box came our black cat who had cosied up on a cold night with our fierce dog. Animals are so funny and great to watch and love. Thank you for sharing at Tell me a Story. What a funny post. We enjoyed reading it. We have a dog who thinks he’s a cat and he does the exact same thing. Perfect photos and story, made me lol. Pets are such a joy! I don’t know what Bill and I would do without our “kids”! With the three of them, we never seem to have a dull moment. God bless “fur babies”! Of course, just like any of us, we have our frtiaove things. I know some dogs that absolutely love the water and others who don’t. I guess the challenge with the dogs that love the water is keeping them IN the kayak! BUt we don’t have that problem with Grace. She’s happy to stay inside. It is nice that she tolerates the rides now. Thanks for stopping by! I just wandered over here from Pioneer Woman’s site because I read your post and had to find out what went on! What a great story! We used to have a black lab that used to carry our cat everywhere by the head in his mouth and people used to call the police. The cat loved it but was always sopping wet. Animals are such fun, well most of the time. Thanks for stopping by! That’s hysterical about the Lab. Kitty was in no danger as Labs are so sweet and are bred to have such soft mouths. We have a female Rottweiler, who was a breeders dog, and loved having puppies. Whenever we have new baby chicks, she wants to mother them and will lay in the pen with them for hours. Now that we are empty nesters our pets are our “kids”. They keep us going! It is facinating to watch these two…… Chuckles was trying to develop a freindship with a meadow vole yesterday! As a cat he is clueless, but adorable!